Chicken broth, especially the organic variety, can be quite expensive at anywhere between $2.00 to $4.00 a quart. I find this kind of amazing considering how watered down and weak the store bought varieties are, and how unbelievably easy it is to make. 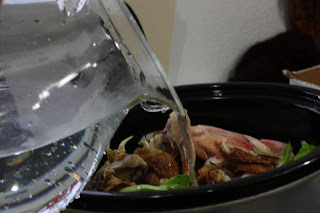 I usually put an entire raw chicken in a stockpot and cook on low with veggies for several hours, but recently found a crockpot version that uses bones and scraps instead, so I thought I'd give it a try. Now, don't think I'm a freak or anything but I am a saver. When I make wings at home, I've always cut the tips off and kept them in a freezer bag in the freezer. I'm not crazy, I'm smart, and I don't think that wasting chicken bones is a smart thing to do. This recipe goes a step further, using the bones and carcass of a rotisserie chicken you get from the super market. 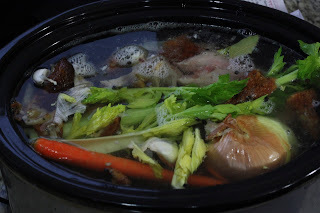 This idea is fabulous because the chicken is already well seasoned and will add a lot of flavor and depth to your broth! 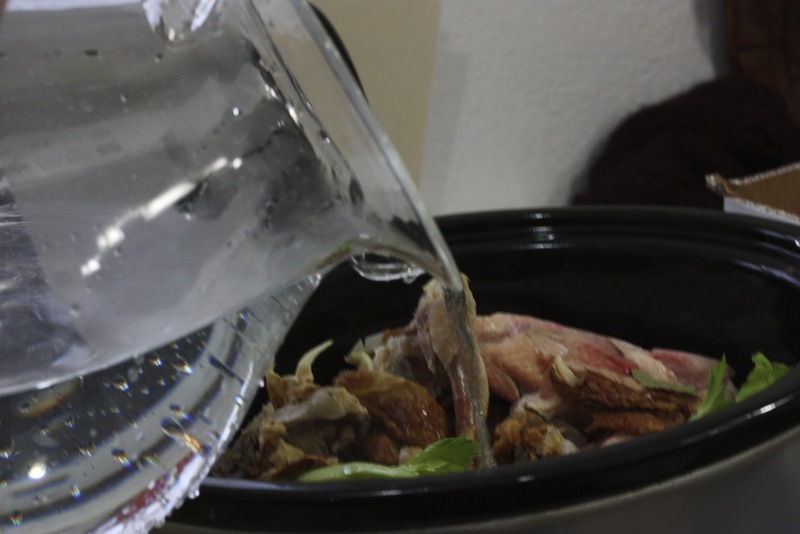 You could even go a step further and keep all your chicken bones from your home cooking in the freezer until your ready to make broth. 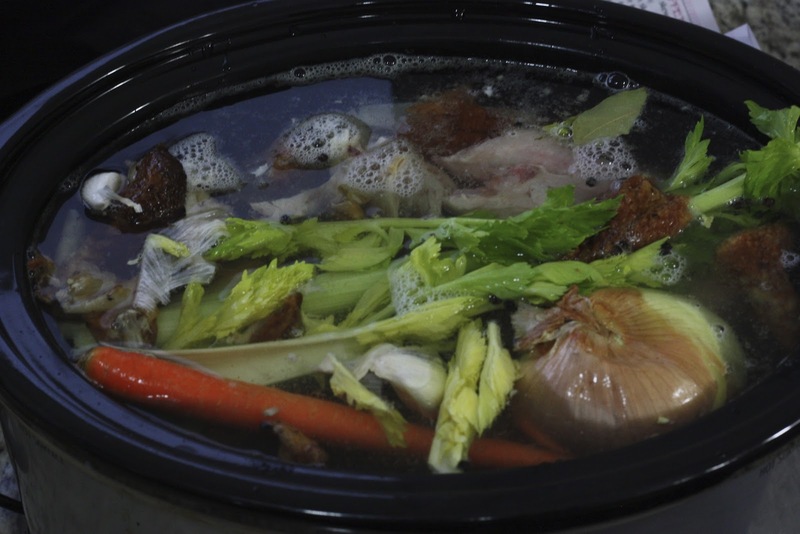 Put the vegetables and bones in a crockpot. Fill with filtered water. I add a bay leaf or two and a handful of whole peppercorns. Add a couple tablespoons of an acidic liquid (I use raw apple cider vinegar). This helps draw the minerals out of the bones. Cover and cook on low for 24 hours. 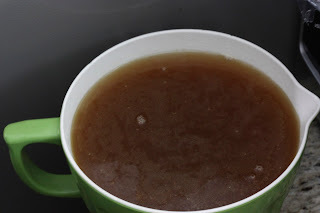 Strain and you have delicious, nourishing chicken bone broth! You can store this broth in bags or jars in the freezer, or it will keep in the fridge for a few weeks. 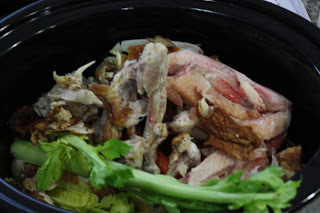 1 whole chicken carcass with a few wing tips made over 4 quarts of broth, which would normally cost between $15 and $20, but I would estimate I spent about $7!